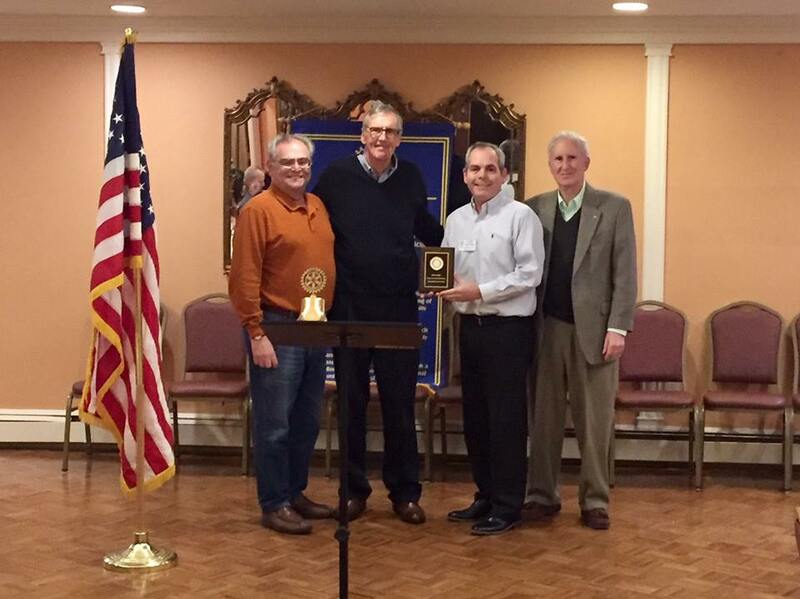 We are an active organization supporting the Rotary ideal of "Service above Self" throughout the Central Bucks area. Our meetings are held on Tuesday evenings, 5:45PM at the Plumsteadville Inn, which is located at 5902 Easton Road, Plumsteadville, PA. We welcome you to join us as a guest. CLICK HERE to find out more about becoming a member of our club. Learn More About Us. 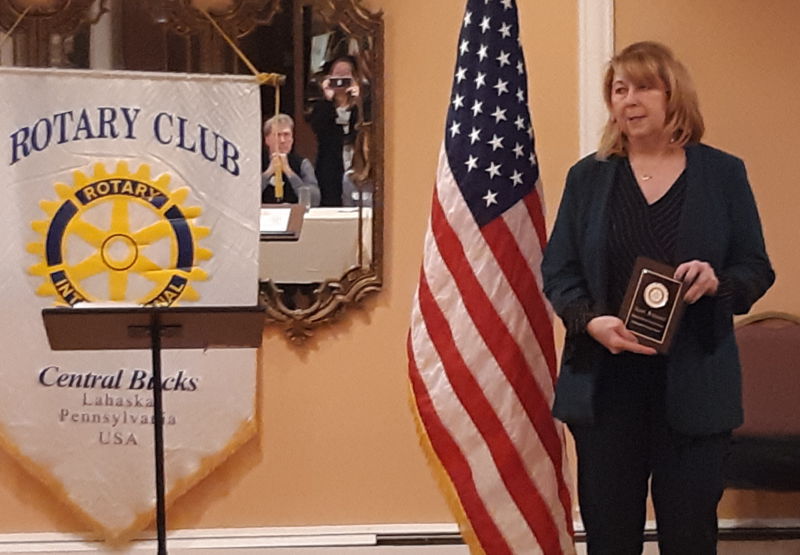 Congratulations to Janet Brennan, Founder and President of Shamrock Reins, on her receipt of the Central Bucks Rotary Quarterly Community Service Recognition Award. The award was presented to Janet at our weekly meeting on January 8, 2019. Shamrock Reins is a nonprofit Charitable Organization formed to provide Equine Assisted Activities and Therapies for Veterans, Active Duty & Reserve Service Members, First Responders, their Families, and the Families of Fallen Heroes. On Saturday, January 5th, 2019, members from Central Bucks Rotary (pictured below) delivered 6 beds and bedding for the OHAAT (One House at a Time) Beds For Kids program. OHAAT (www.ohaat.org) delivers beds, bedding, and tools that encourage healthy bedtime habits like books and toothbrushes, directly to the homes of children in need. In order to qualify for Beds for Kids, children must be between ages 2 and 20 and reside in a household whose income is below the US poverty threshold. Many of the children in the program are transitioning from shelters or other temporary housing; some are recovering from catastrophes such as fires or floods; and others have been sleeping without a bed their whole lives. Every child in the program receives a new bed and a bedtime bag, which contains a set of sheets, a blanket, several books, and a toothbrush. 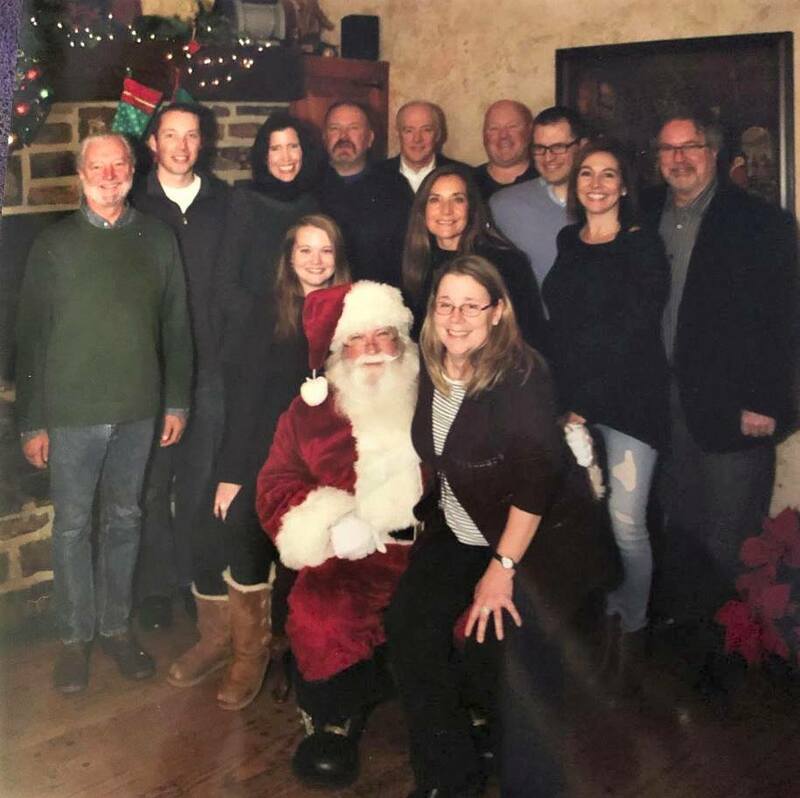 CB Rotary hosted a meet and greet with Santa at the Plumsteadville Inn on Tuesday, December11, 2018. Our holiday fundraiser benefited A Woman's Place and included a Santa photo opp for kids, combined with a Toy Drop, and Tommy Greene, former Phillie autographing baseballs for donations. We collected many gifts to be donated to local children in need. Tuesday night, December 4, 2018, was a great night to be a Rotarian as Central Bucks Rotary donated over $30,000 to beneficiaries who support our veterans in the local community. This is made possible by the support from so many people who help us with our annual event - Ride For The Heroes. We want to say thank you to our 2018 Commander in Chief Sponsor, Arrow Real Estate Services, and thank you to all our great sponsors, riders, volunteers and fellow Rotarians who work year round to make the ride a success. At our dinner last night we were able to see the fruits of our labor as we put money in the trusting hands of great organizations that support our veterans in many different ways. 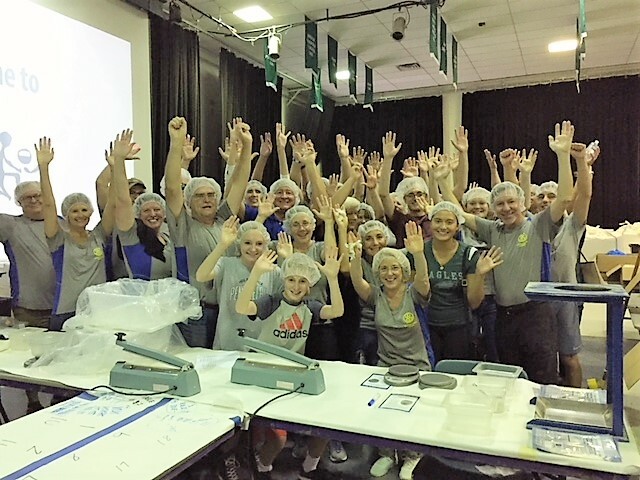 On Sunday, October 7th, 2018, Central Bucks Rotarians helped turn Hunger into Hope by packing 15,120 meals in an hour and a half in the Feed My Starving Children event held at Delaware Valley University. Overall, 150 volunteers packed over 78,000 meals. Fun was had by all!! Click on the this link for a slide show. CB Rotary Pool Social - Fun, Food, and Fellowship!! 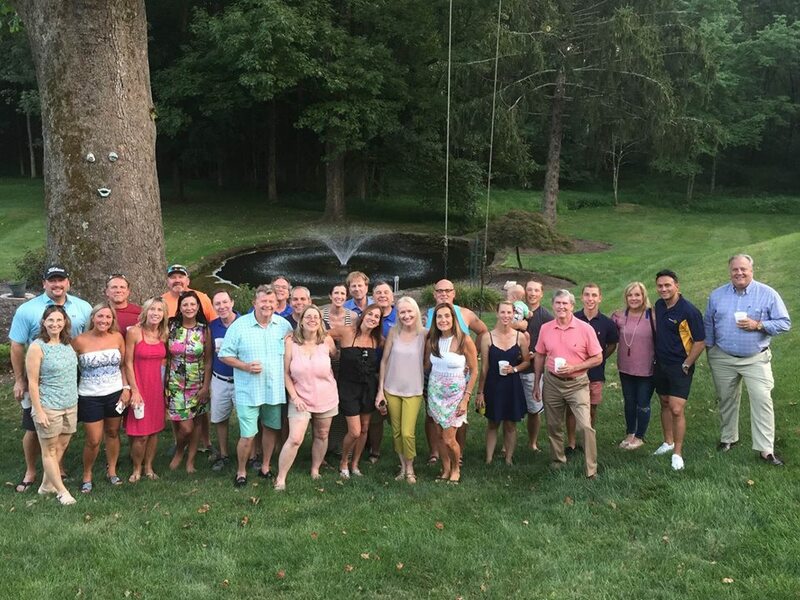 August 28, 2018 Fun, food, and fellowship was had by all at our great Central Bucks Rotary Pool Party, generously hosted by our Membership Chairperson Pam Northrup. Keep your eyes open for our next new membership event. On Sunday, July 22nd, CB Rotary members again volunteered at the the Doylestown Food Pantry. Thanks to Rick James in his continued efforts in coordinating this wonderful activity. July 10th, 2018. 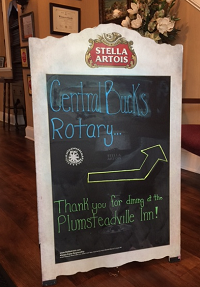 Central Bucks Rotary was presented with the District Governor's Award at our weekly meeting at the Plumsteadville Inn. Each year, the District Governor sets goals for clubs in the district to meet or exceed. This year 11 out of 45 clubs got this award and we were one of them! Great job and congrats to past president Bill Flax and current president Kathi Atkinson for leading our club. Thank you Assistant District Governor John Ortolf for attending and presenting at our meeting. Keep up the great work for the 2018-2019 year and make this the best year yet! 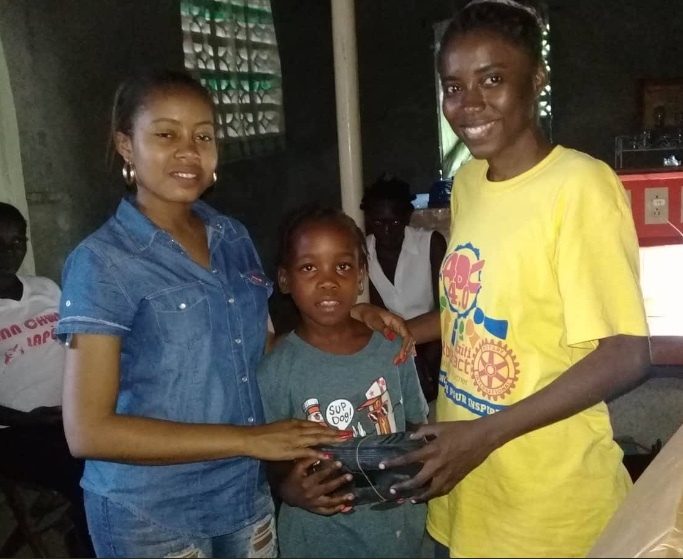 CB Rotary recently received confirmation from the Rotaract Club in Petionville, Haiti that they completed their "Shoe that Grows" project on June 16 and distributed shoes to children in need. Many thanks to Chris Kauffman for coordinating this project. June 10, 2018 Despite the rain, the 2018 RFTH was a great success! Fun was had by all! See article in the Intelligencer below. Click image to enlarge. Congratulations to Martin Heaps on his receipt of our Quarterly Community Service Recognition Award. 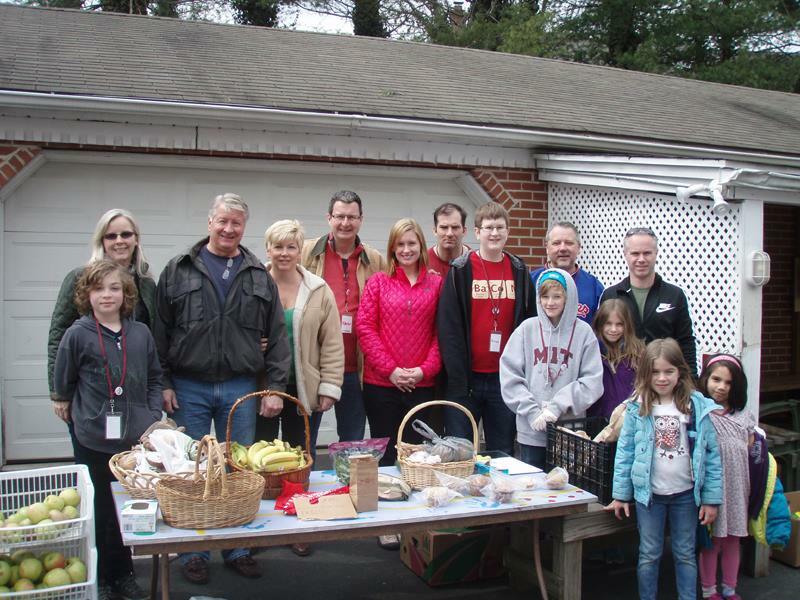 Martin manages the Doylestown Food Pantry operated by the Bucks County Housing Group. Pictured below are Steve Mazzo, Martin Heaps, Chris Kauffman and Bill Flax. 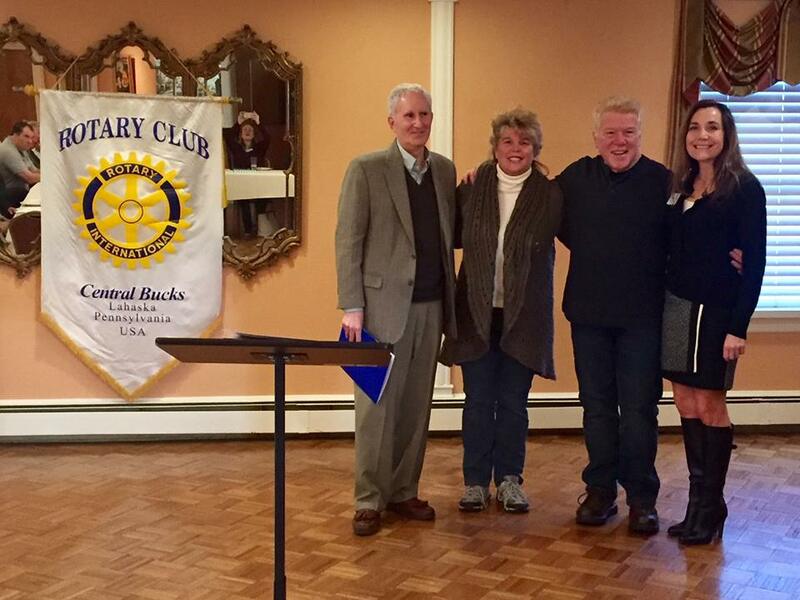 Please join us in welcoming Jim Richardson and Nancy Carey-Richardson as the newest members of the Central Bucks Rotary. Pictured below are Bill Flax, Nancy Carey-Richardson, Jim Richardson and Pam Northrop. 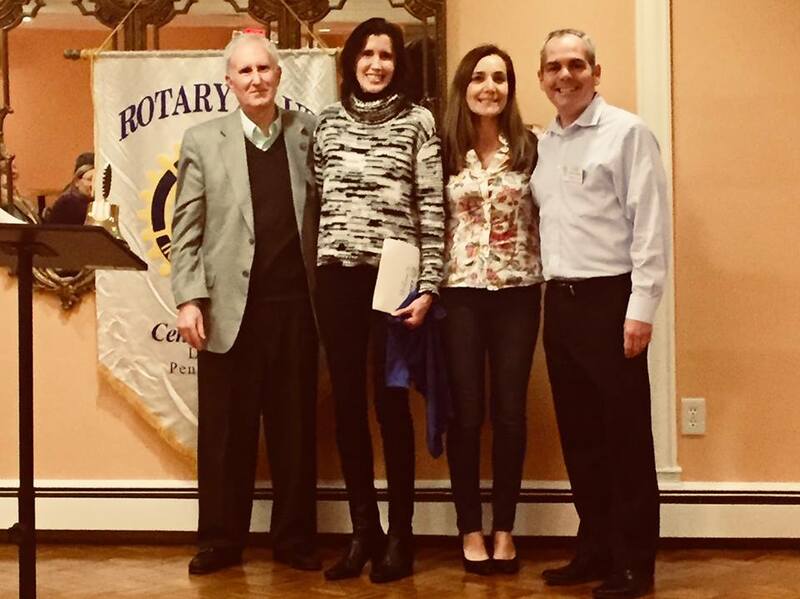 Welcome to Elayne Recupero, Central Bucks Rotary's newest member. Left to right in the picture below are President Bill Flax, Elayne Recupero, Membership Chairperson, Pam Northrop, Sponsor & Foundation Chairperson,Chris Kauffman. January 16, 2048. 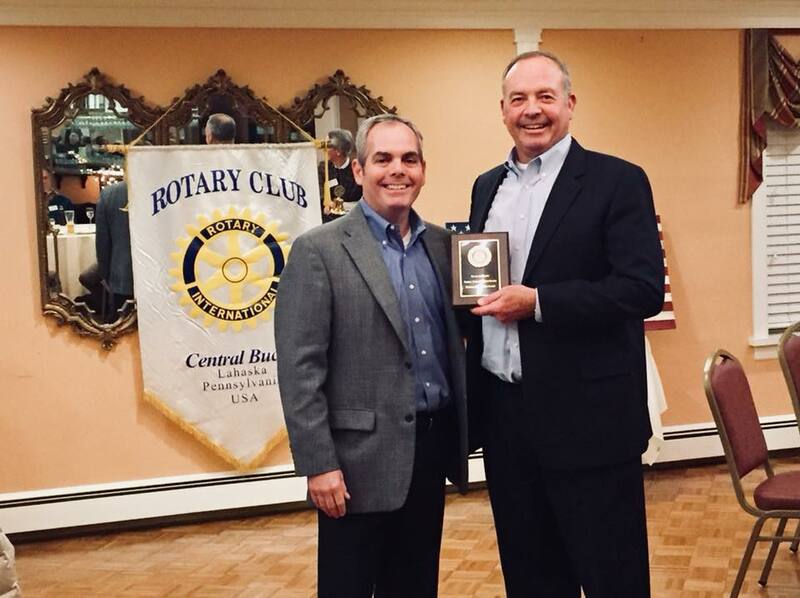 The Central Bucks Rotary awarded its first Community Service Award to Kevin McPoyle, the local organizer for the Feed My Starving Children event. Kevin is pictured below with past president Chris Kauffman. January 16, 2018. 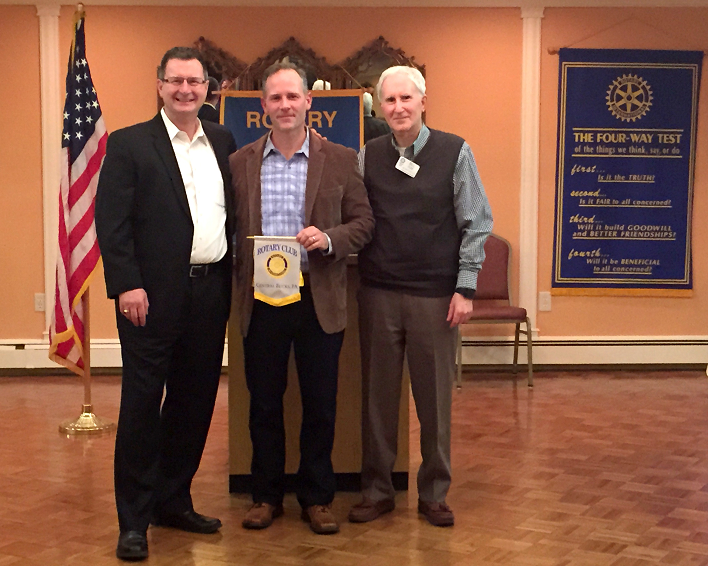 The Central Bucks Rotary is proud to welcome Scott Patchkowski as the newest member of our awesome organization. Patch is pictured below with Membership Chairperson Pam Northrop and President Bill Flax. 2017 Pub Walk a Success! The 2017 Pub Walk was held in downtown Doylestown on Thursday, December 14th. Rotarians started at Villa Capri, moved on to MOM's, and finished up at Chambers The Other Side to the sounds of our Rotary band, BKWG. Checks were presented to our beneficiaries, Bucks for Kids (Bucks County Children of Foster Care), Plumstead Twp. Shop with a Cop (Children faced with Life Challenges), and TOPP Foundation (Children with Type 1 Diabetes). 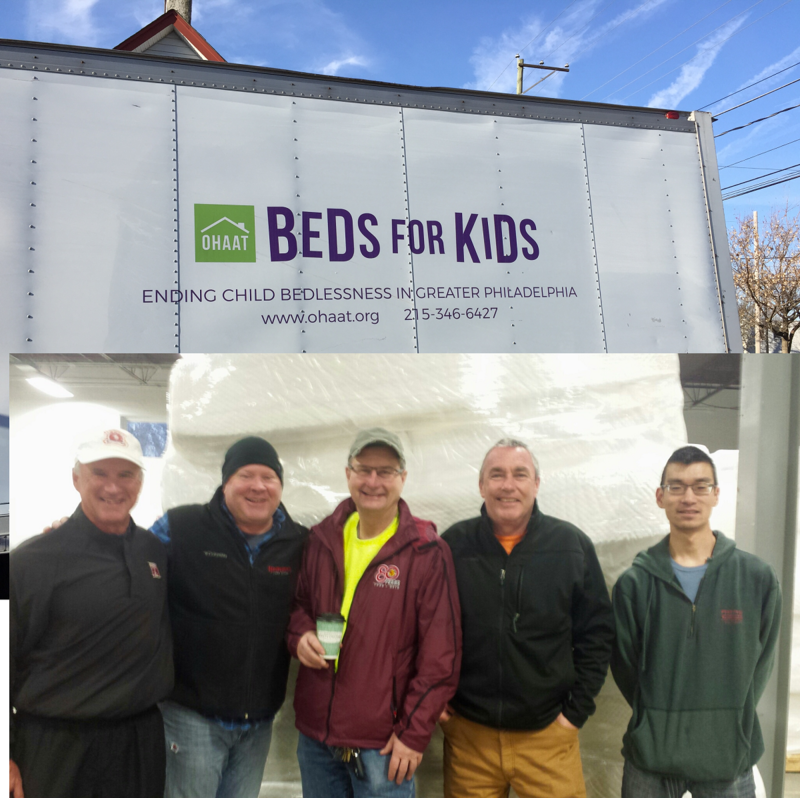 On Saturday, December 2nd, 2017, members from Central Bucks Rotary (pictured below) delivered 10 beds and bedding for the OHAAT (One House at a Time) Beds For Kids program. OHAAT (www.ohaat.org) delivers beds, bedding, and tools that encourage healthy bedtime habits like books and toothbrushes, directly to the homes of children in need. 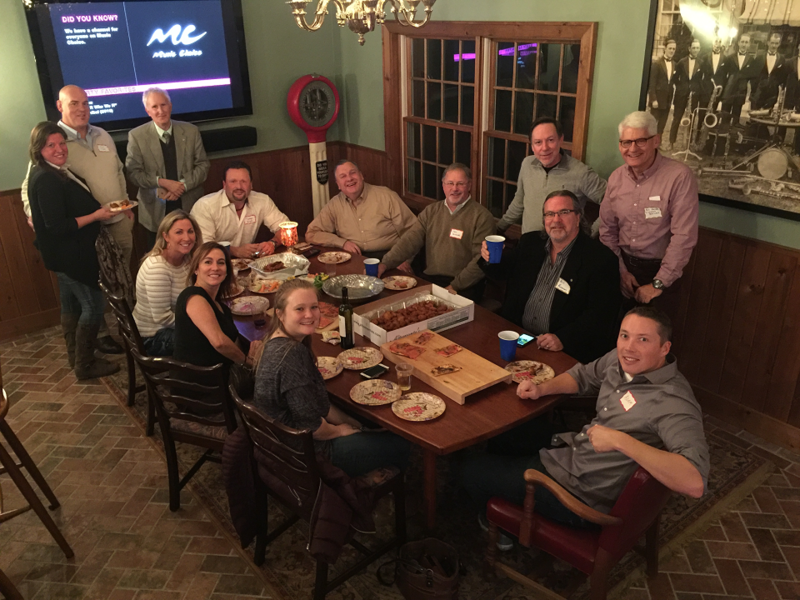 On 11/16/17, Central Bucks Rotary hosted an after work New Membership Happy Hour/Open House. The event created great energy, was a great success, and resulted in 12 potential members...plus it was a lot of FUN! 2017 Ride for The Heroes Beneficiary Presentation. 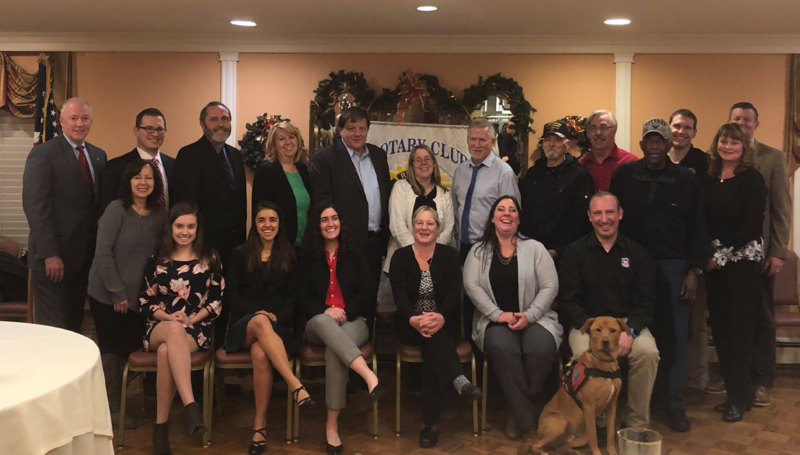 Rotary Club of Central Bucks presented $33,500 in grants to local organizations that serve veterans and families of fallen heroes at a reception held on October 10 at the Plumsteadville Inn. 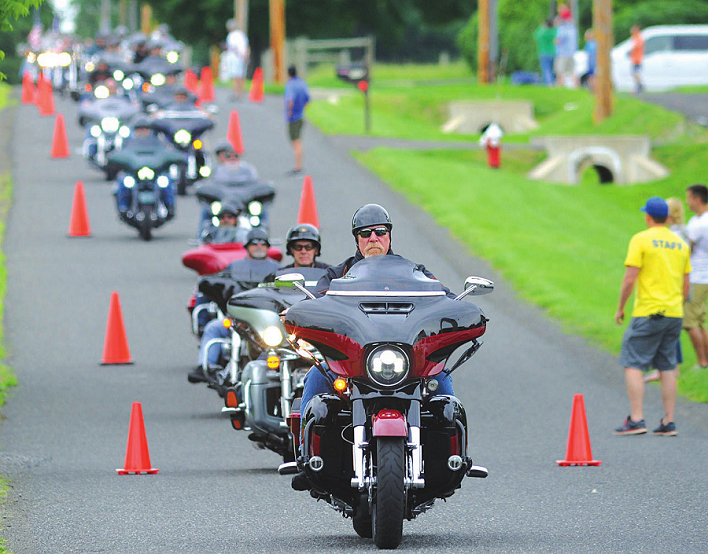 The funds were raised at the club’s 8th annual Ride For The Heroes and Picnic, held in June. Ride For The Heroes is a police-escorted motorcycle ride through the Bucks County countryside and parts of New Jersey. This year more than 600 riders participated in the event. Grants were awarded to ten organizations whose missions range from sending out care packages to troops deployed overseas, to providing equine therapy to veterans. The presentation event was very well attended by members, guests, and Ride for The Heroes beneficiaries and sponsors. Please see Press coverage: Official Press Release | Bucks County Herald | The Intelligencer. First Annual Family Fall Fun Festival a Success! Central Bucks Rotary's First Annual Family Fall Fun Festival was a great success! The fundraiser was held on October 7th, 2017 at the Fraternal Order of Police Picnic Grove in Bedminster Township. Funds raised at the festival will benefit children's charities in Bucks County. Festival goers enjoyed pumpkin painting, face painting, a bounce house, a strolling magician, music and dance. The day was topped off with a showing of the animated movie "Rock Dog". 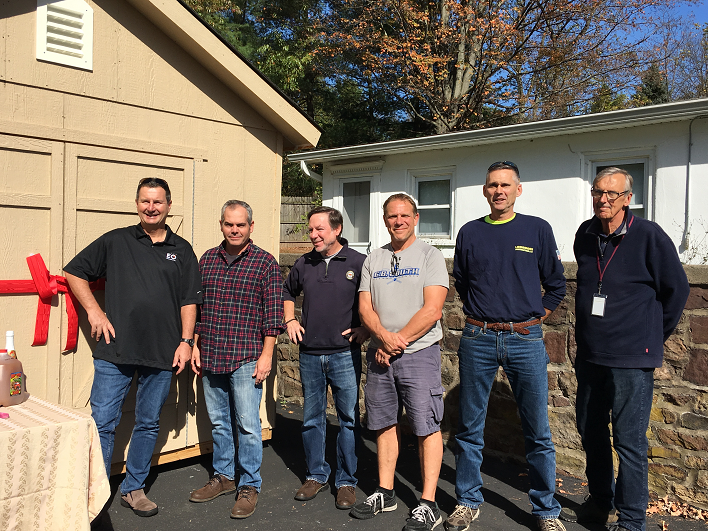 Central Bucks Rotary recently completed work on a new shed for the Bucks County Food Pantry and celebrated its completion with a ribbon cutting ceremony. 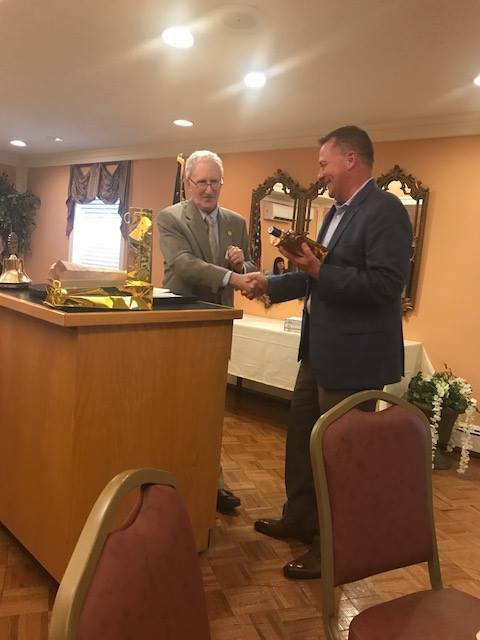 On Tuesday June 27th, the Central Bucks Rotary was proud to welcome our new incoming President Bill Flax for the 2017-2018 Rotary Year. A huge thanks to our out going president William Rossman for a great year and all the hard work he put into the club. 2017 Ride For The Heroes A Great Success!!! June 4th, 2017. 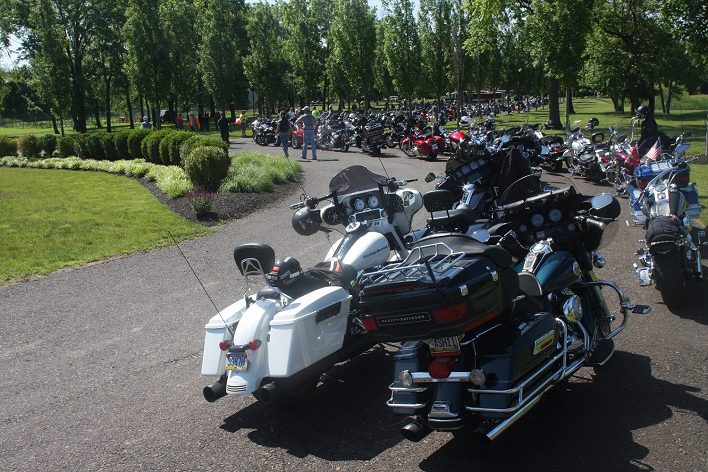 Central Bucks Rotary's 8th Annual Ride for the Heroes was once again a huge success! The iffy weather decided to cooperate allowing us to achieve near record participation. Thanks to all members, family, friends and sponsors for their support. CLICK HERE for an article from the Intelligencer. See below for picture from ride and picture of breakdown crew. 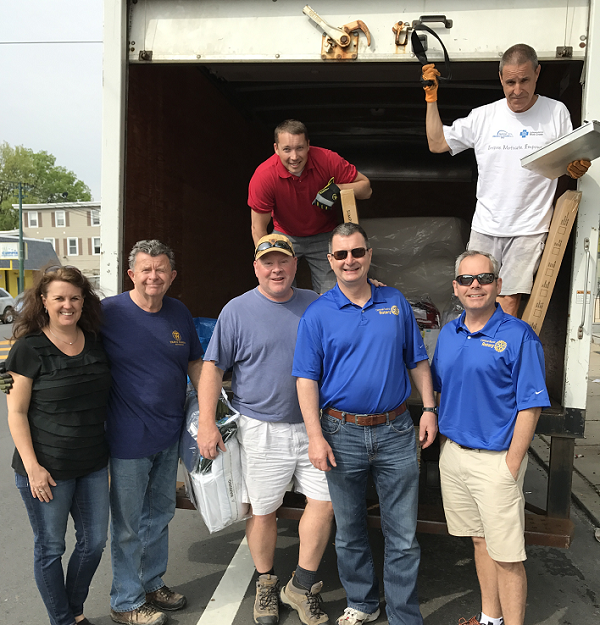 On Saturday, April 29, 2017, members from Central Bucks Rotary (pictured below) delivered beds and bedding for the OHAAT (One House at a Time) Beds For Kids program. 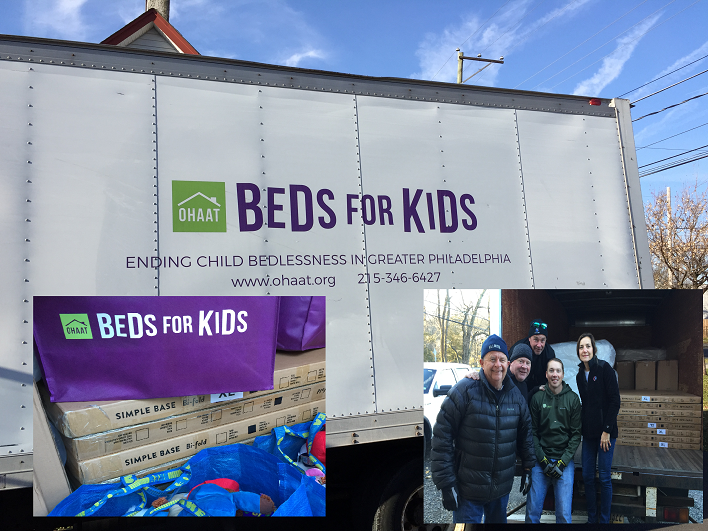 OHAAT delivers beds, bedding, and tools that encourage healthy bedtime habits like books and toothbrushes, directly to the homes of children in need. RFTH Painting Day at the FOB Picnic Grounds a Huge Success! 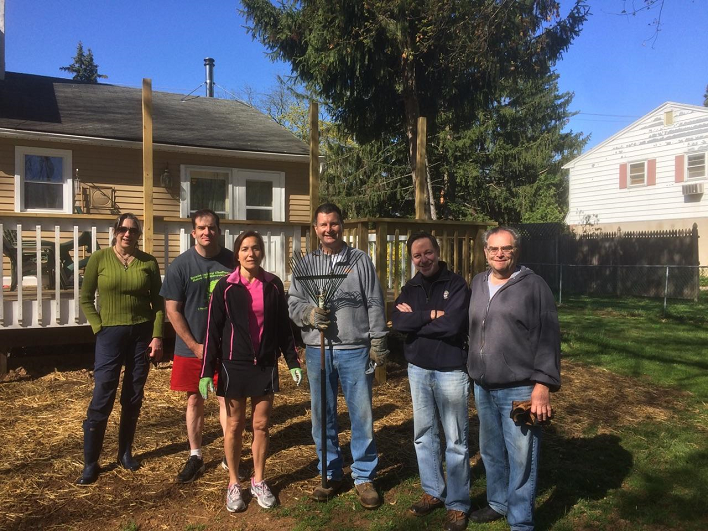 On Sunday, April 9th, 2017, a lively group of Central Bucks Rotarians, their family members, and Rotary friends spent the day scraping, sanding and painting doors, support poles, and other items at the Fraternal Order of Police picnic grounds in Dublin in preparation for the upcoming Ride For The Heroes on June 4. A huge thanks to all Rotarians, their family members, and Rotary friends for a great day of accomplishments! A very special thank you to Kevin Kaufmann for organizing and directing this fun event! Please CLICK HERE, and then click on "Start Slideshow" to view more pictures including "Before" pictures. 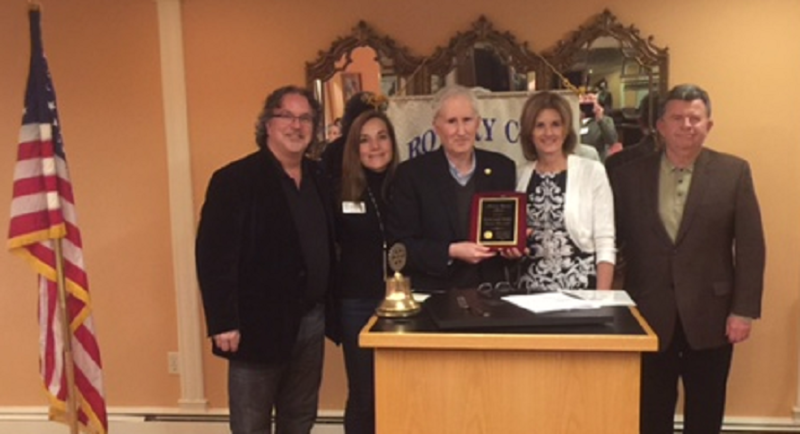 At our meeting on Tuesday, March 28th, 2017, an Honorary Central Bucks Rotary membership was presented to Kevin Wallace's family. This was the first Honorary membership presented by our club in it's seven year history. At our meeting on January 24th, 2017, Central Bucks Rotary and Rotary District Governor Linda Young presented Paul Harris Fellow Awards to 8 members. These Rotarians have demonstrated their dedication and support of Rotary and the Rotary Foundation, which is an international organization that provides services to people in need around the world. The Rotary Foundation activities include supporting the vaccination of children against Polio, and the development of programs and services in the areas of health, human services, community development, education, as well as working for world peace and conflict resolution. Pictured below are past and new Paul Harris Fellow Award recipients. 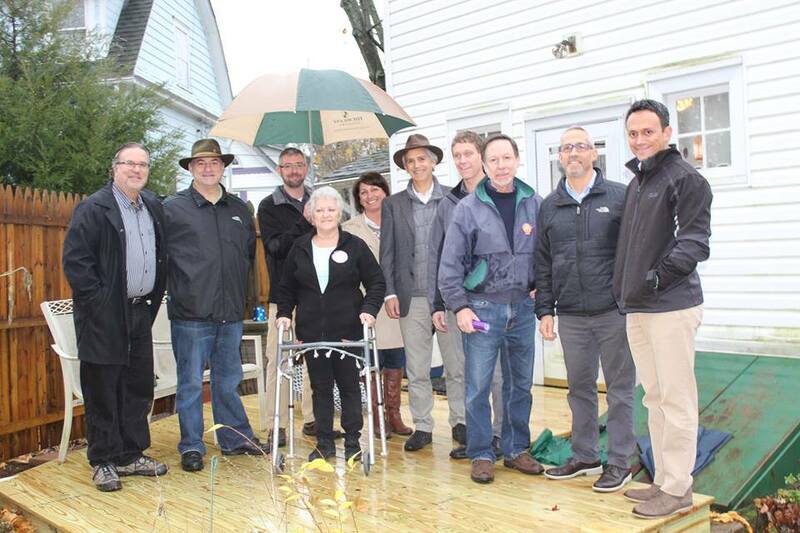 Although the weather didn't fully cooperate, Twilight Wish Foundation in partnership with Central Bucks Rotary was happy to grant Joann McHugh's wish for an accessibility ramp and walkway yesterday. This wouldn't have been possible without the Central Bucks Rotary Rotabuild program, The Home Depot Foundation and The Provident Foundation. Thank you to the many community members who also contributed to this project: Raphael Architects, Ernst Brothers, Techo-Bloc, Phillips Contracting Inc, and Stone Depot. 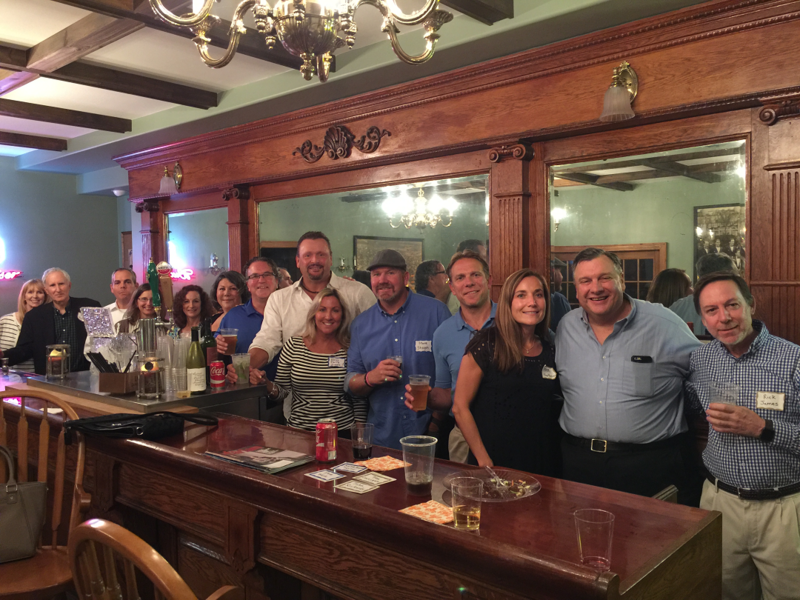 Our Membership After Hour Happy Hour was held on October 20, 2016 and was a tremendous success. Everyone had a great time and the event was by far the most successful membership event to date! 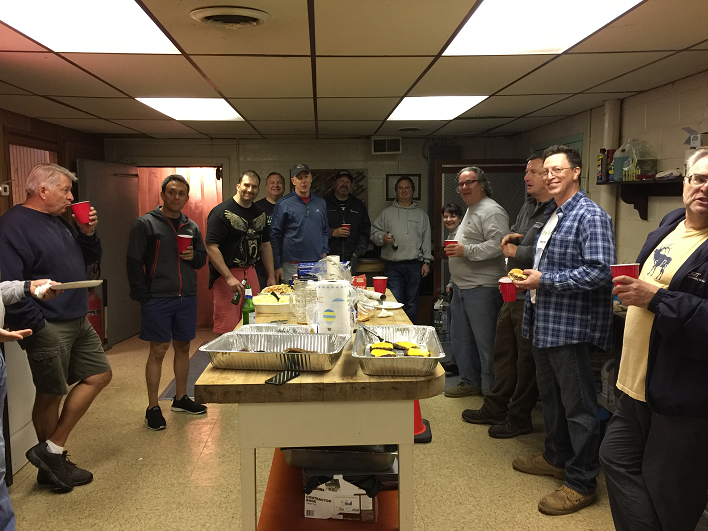 We had over 27 attendees! Many thanks to our gracious host Pam Gundlach! On August 23rd, 2016, Central Bucks Rotary presented a check to the Cerminara family in conjunction with Wehrung's Lumber to support a project they are sponsoring to aid the family. We wish Jack and Wendy well in their continued fight against cancer. 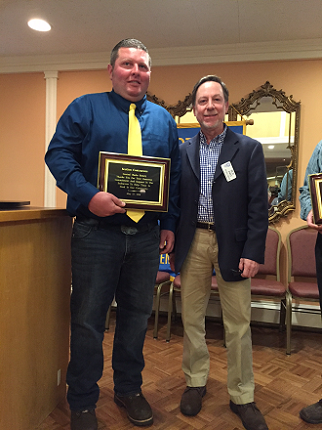 On May 17th, 2016, Central Bucks Rotary honored Wehrung's Lumber and Scollon Contractors. These two companies have generously donated their time and materials to many of our local construction projects including the Shamrock Reins Wheelchair Ramp, the Rotobuild Ridge Crest Pergola Project, the Obert-Thorn Wheelchair Ramp Project, and the Colamarino Wheelchair Ramp Project. 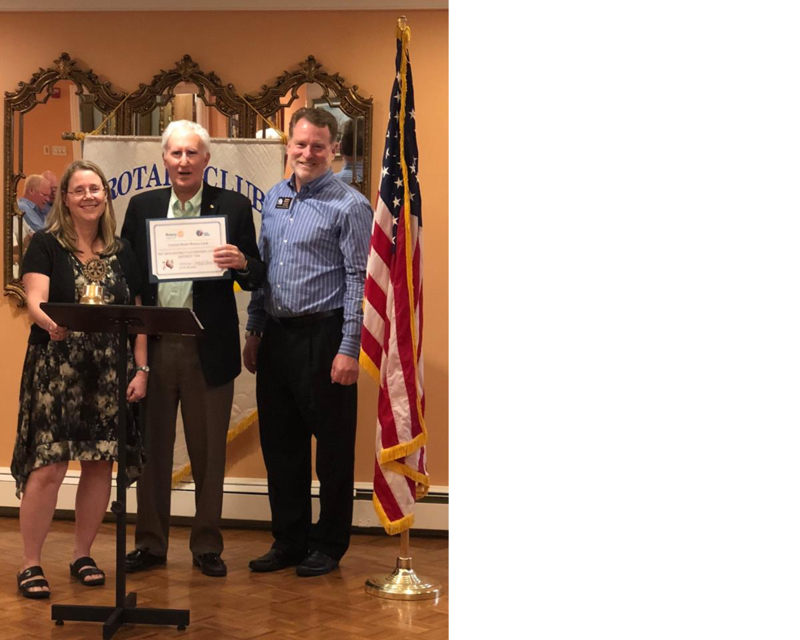 PLUMSTEADVILLE, Pa. – The Rotary Club of Central Bucks announced a “Leap For Others” charitable initiative today in support of several non-profit organizations. The club will take advantage of the extra day in the year to give a little extra to families in need, both locally and around the world. Beginning February 29, and over the next 29 days, The Rotary Club of Central Bucks is challenging the community to donate via its website, www.centralbucksrotary.com. 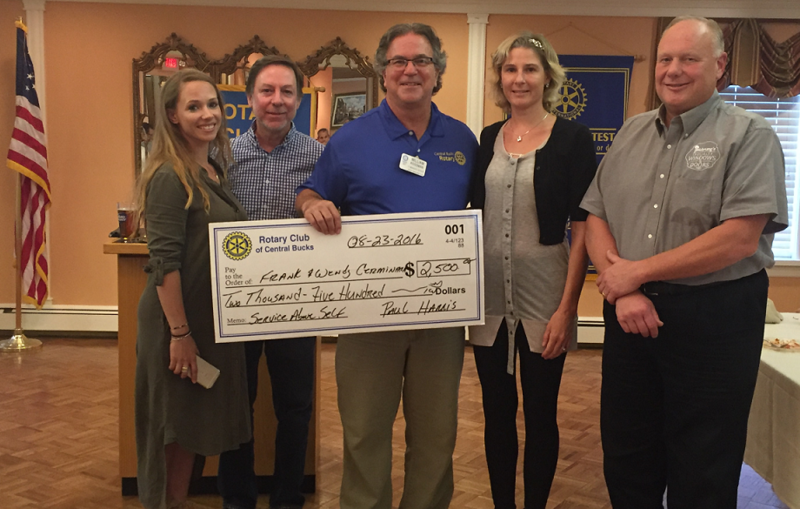 The Rotary Club of Central Bucks will match up to $29,000 in community donations that it receives through March 29, 2016, and will distribute the proceeds to organizations serving families in need. 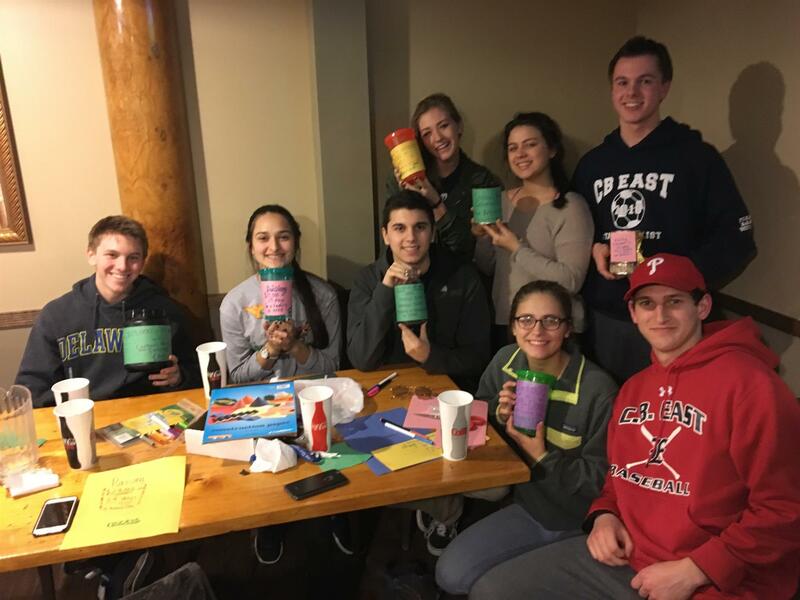 Seventy-five percent of the total raised will go to local organizations, including Bucks County Housing Group, A Woman’s Place, and HealthLink Dental Clinic; and twenty-five percent will go to international humanitarian projects, including Shelter Box and Rotary International’s polio eradication program. 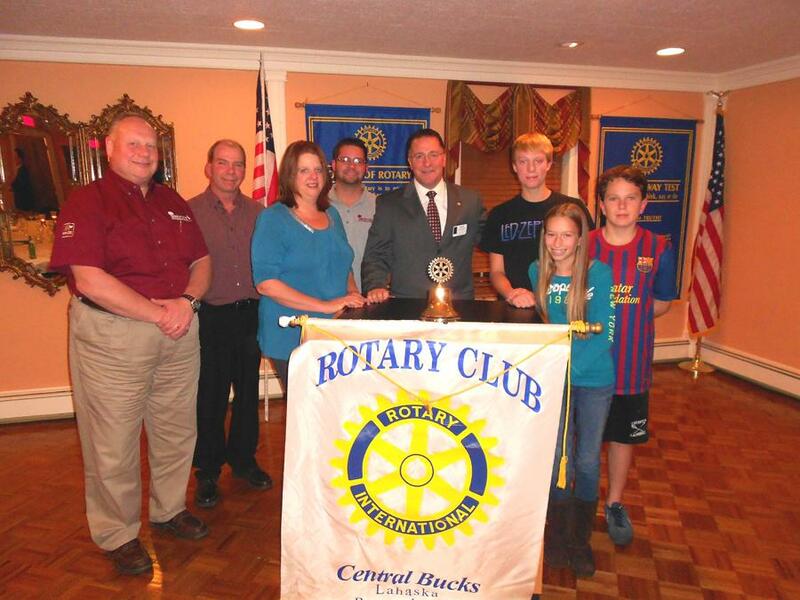 Inaugural Central Bucks Rotary Raffle a Success! 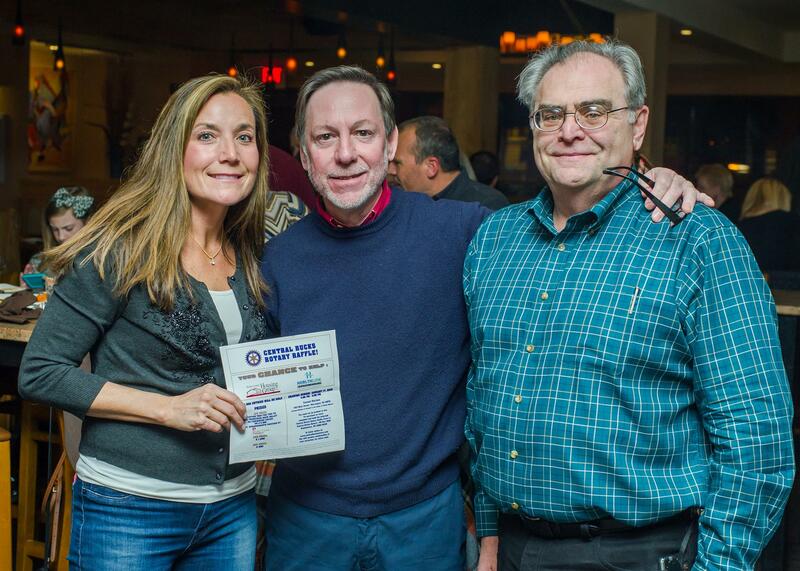 The Inaugural Central Bucks Rotary Raffle was held at Carmel Kitchen on Sunday, January 17th, 2015. A great time was had by all! Congratulations to our winners: 1st Prize - $5000 - Ellen Dodel from Langhorne, PA, 2nd Prize - $1000 - Ken McDaid from Chalfont, PA and, 3rd Prize - $500 - Michelle Cascerceri from Doylestown, PA. Raffle proceeds benefit Bucks County Housing Group, and HealthLink. Click HERE to view more photos. Last week our club was very fortunate to have a surprise visit from Lisa Gruber, our former exchange student from Argentina. Lisa gave us a great update on her past activities and future plans. Pictured below are former president Mike Esposito, Lisa Gruber, and current president Chris Kauffman. 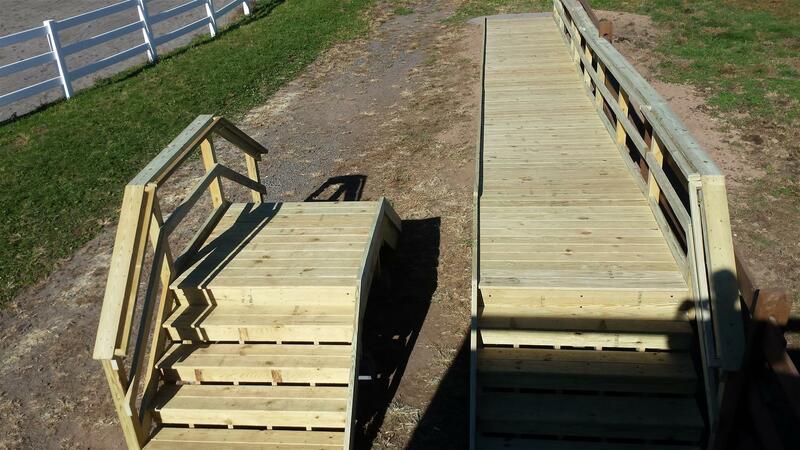 Thanks to Rotary members, friends of Rotary members, and especially to Taylor Presnell and his crew in the succesful construction of a wheelchair ramp at the Shamrock Reins Riding Facility. Shamrock Reins is a nonprofit Charitable Organization formed to provide Equine Assisted Activities and Therapies for Veterans, Active Duty & Reserve Service Members, First Responders, their Families, and the Families of Fallen Heroes. Please click here for a SLIDESHOW. Funds were raised at sixth annual Ride For The Heroes to benefit wounded veterans and families of fallen heroes. October 6, 2015. 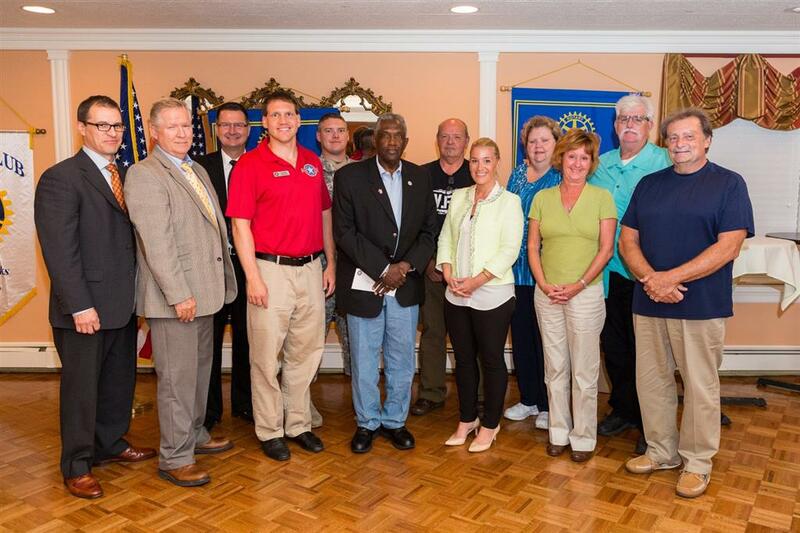 The Rotary Club of Central Bucks presented financial grants totaling more than $35,000 to six local organizations that assist wounded veterans and families of fallen heroes. The presentation took place on Tuesday, October 6, at the Plumsteadville Inn, 5902 Easton Rd, Plumsteadville, Pa. 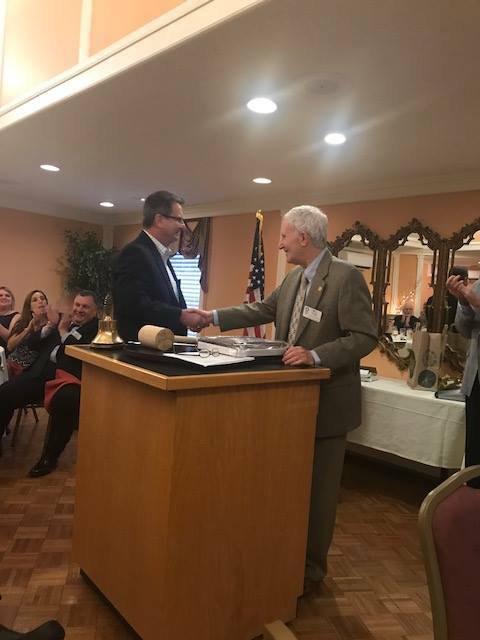 The organizations selected to receive grants were: Bucks County Department of Veterans Affairs; Delaware Valley Stand Down; Gold Star Mothers; Operation Homefront; Travis Manion Foundation and Vets for Vets. Representatives from each organization will be on hand for the grant presentation. 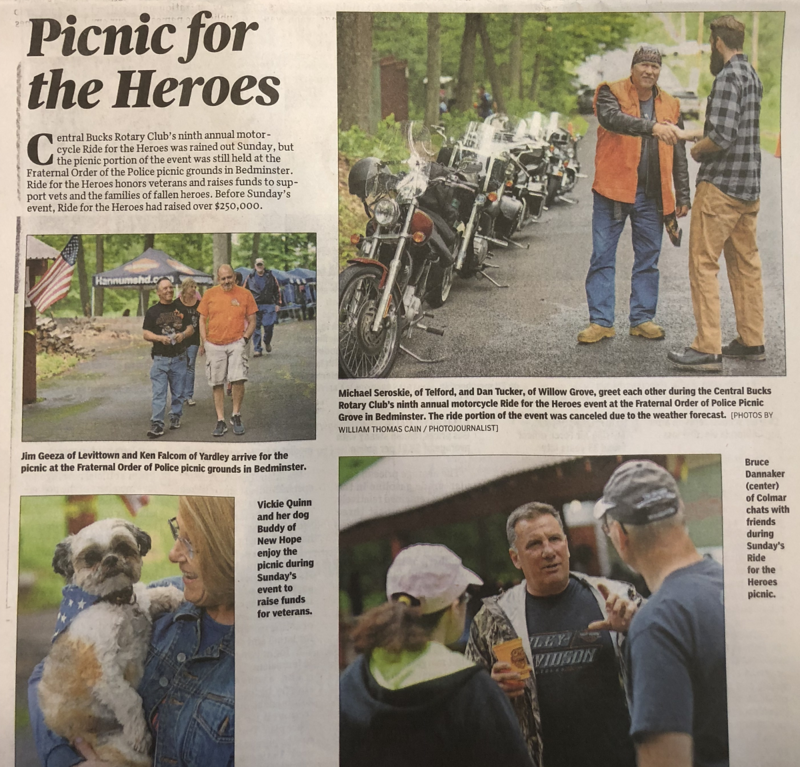 The funds were raised by the Rotary Club of Central Bucks at their sixth annual Ride For The Heroes, held on Sunday, June 7, 2015. 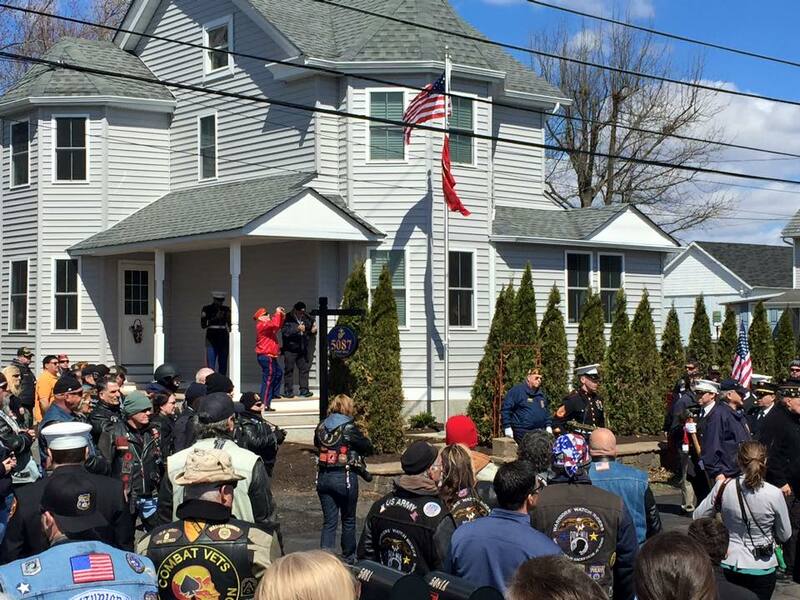 690 motorcycle riders joined together for this year’s police-escorted ride led by Steve Cantrell, former Marine, current teacher and coach at Delaware Valley University, who rode the motorcycle of fallen hero Travis Manion. Cantrell and Manion met at the U.S. Naval Academy and served in Iraq together before Manion made the ultimate sacrifice in 2007 while in service to his country. 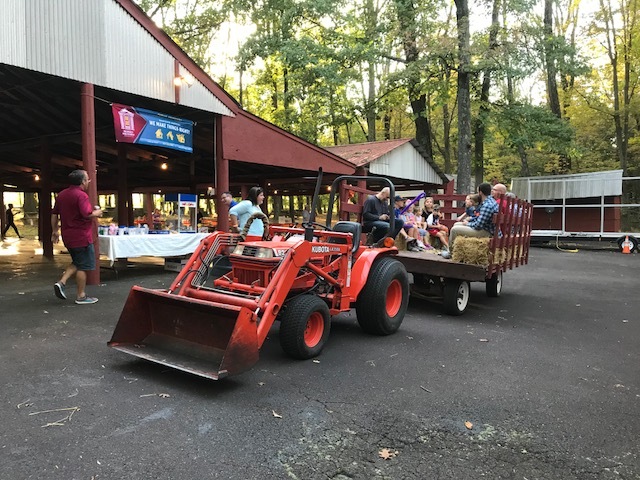 The ride traveled from the Garden of Reflection in Lower Makefield, Pa., to the FOP Picnic Grove in Bedminster Township, Pa., where guests and riders enjoyed a picnic lunch. For the first time this year, community members were offered a special opportunity to honor a service member who is on active duty, retired or deceased, through a donation of $50.00. All veteran recognitions were announced at the Garden of Reflection before the ride commenced. Last night, CB Rotary welcomed our exchange student from Bolivia, Octavio Martinez. We are looking forward to sharing many memories and activities with Octavio throughout the next year. Octavio will be attending Central Bucks East as a senior. Our out-bound exchange student, Katie Marron, returned from Bolivia and visited our meeting last night to share a few pictures and experiences from her year there. Pictured below are Katie, her Mom and our President Chris Kauffman. 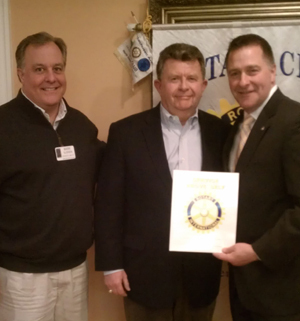 Central Bucks Rotary Welcomes our Newest Member John Rickards! 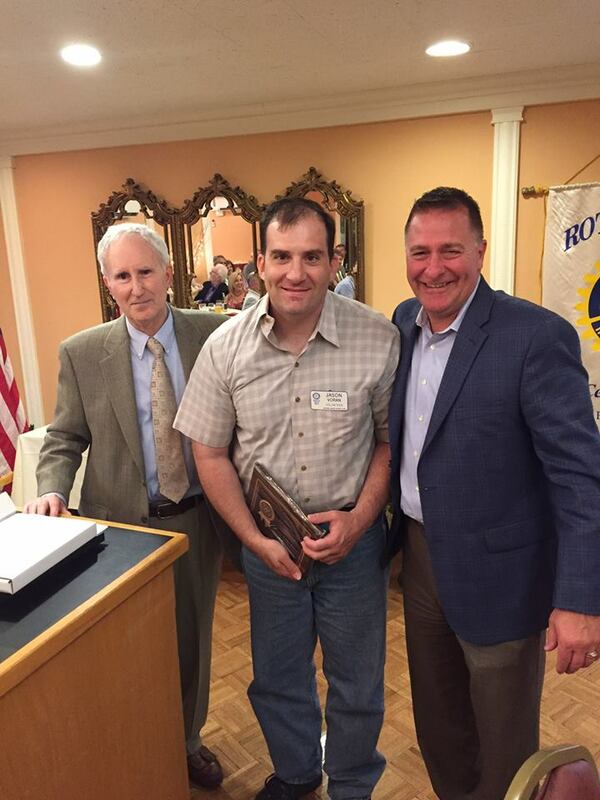 On July 21st, 2015, Central Bucks Rotary welcomed our newest member John Rickards. John is a retired Navy Chief and is now in a sales & marketing position. He learned about our Rotary club through Ride For the Heroes and is eager to serve. John is committed to the PR and youth services committee. 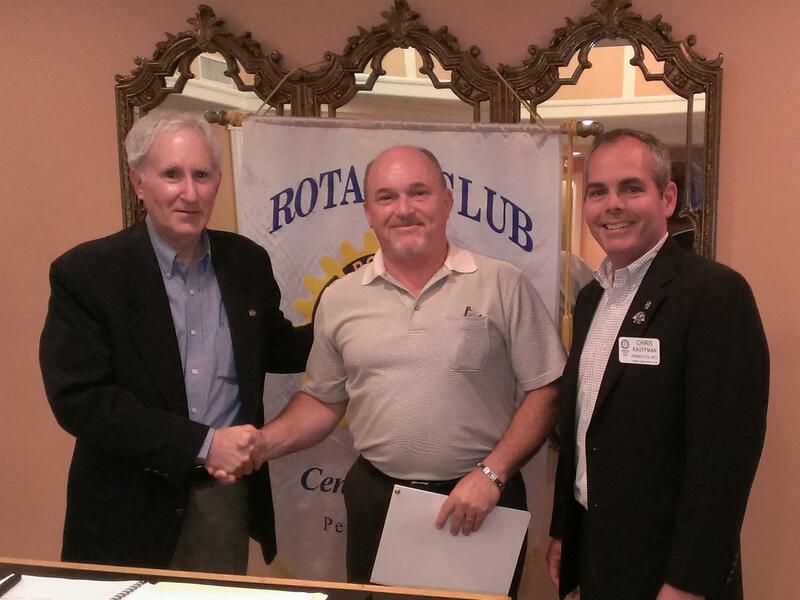 Pictured below are John, our new president Chris Kauffman, and Bill Flax. On Monday, July 20, 2015, members from Central Bucks Rotary helped move some furniture into a new apartment for a client of the Deserving Décor organization. The client, a US Air Force Veteran named Chizoba N., was recently able to move into a new apartment in Chalfont, but had no furniture. Deserving Décor gathered donations, and with the help of Central Bucks Rotary, was able to furnish his apartment with a sofa, a desk, a TV table, a coffee table, a dining table with 2 chairs, a bed with frame, two small chests of drawers, a toaster oven, pots & pans, and bed linens. Pictured (from left to right): Rick James, Chris Kauffman, Curt Cyliax, Chizoba N., Bill Rossman. Not pictured: Laura Kauffman (Deserving Décor). 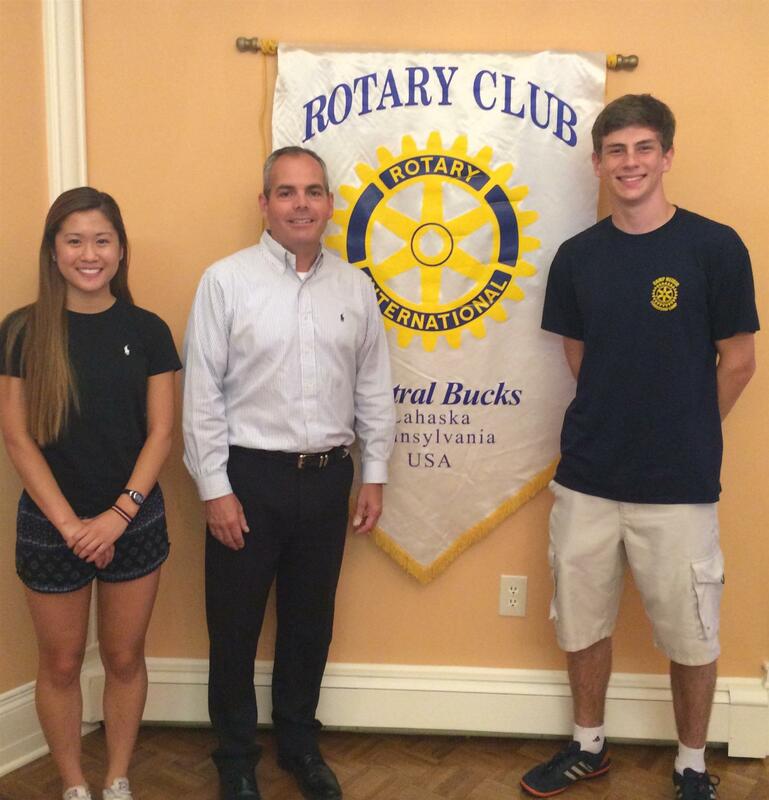 Two of our sponsored Camp Neidig Leadership program students from CB East attended our meeting last night. The students enlightened us with their recent rewarding experience as our first sponsored students to the program. The Camp Neidig Leadership program focuses on leadership seminars, problem solving, guest speakers, workshops, and group activities. The 2015 Ride for the Heroes was yet another great success this year! It was a perfect day for our riders, guests, sponsors and members. We counted 556 bikes with 749 riders & passengers, a 10% increase over last year. To see some great pictures that Leslie took, click HERE, and then click on Start Slide Show. 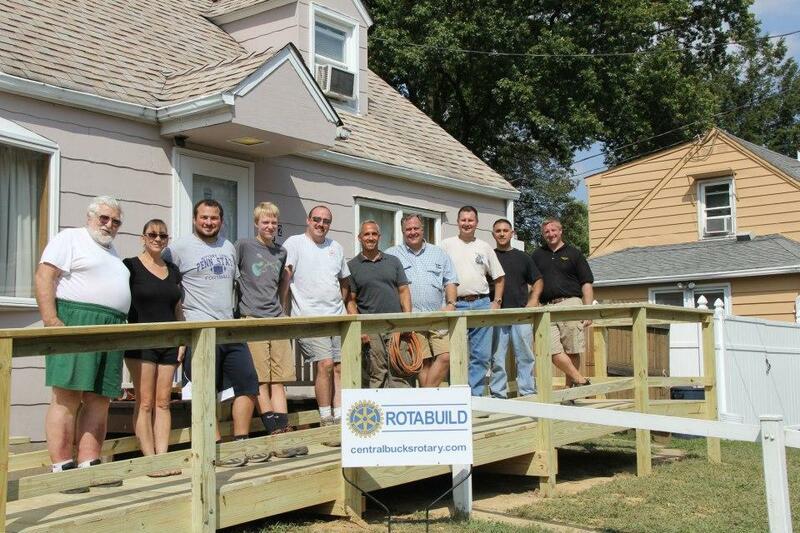 This past weekend, Central Bucks Rotary completed yet another wheelchair ramp - the Colamarino Project. Thanks to all that came out to help! On Saturday, April 4, 2015, a celebration was held for the RenovatingHope project and Ssgt. Jessica Clymer. The celebration was held at the Plumsteadville Volunteer Fire Company, which is across the street from Jessica's newly renovated house. CB Rotary made a generous donation to assist in rebuilding her home. Staff Sgt. 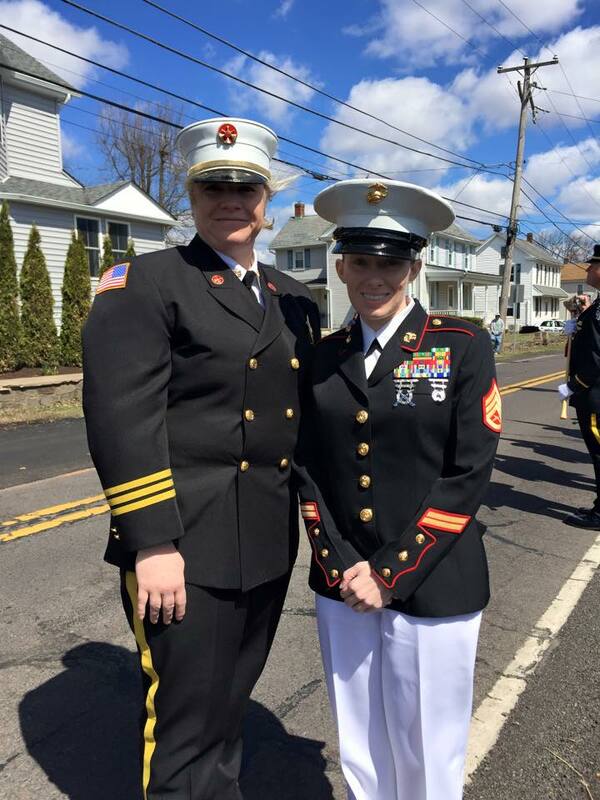 Jessica Clymer, who was raised in Buckingham and now lives in Plumsteadville, is a disabled Marine veteran who fought in Iraq and Afghanistan. Her home sustained serious damage due to a leaking roof and much more while she was deployed. Thanks to all Central Bucks Rotary volunteers at the Doylestown Food Pantry Sunday, November 23, 2014. It was another great day of service for the community! 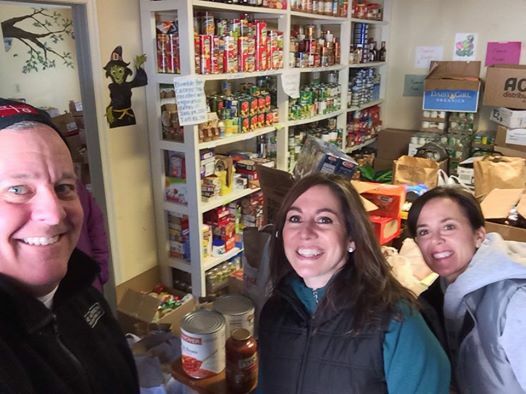 Central Bucks Rotarians Mark Glidden and Jen Statler delivered 369 pounds of food to the Doylestown Food Pantry. The food pantry states that despite the claims that the job market is improving the need for food is as strong as ever this Thanksgiving. How AWESOME it was to give away $30,000 last night! We as a club should be very proud that the fruit of our labors will have such a profound impact on our community. Kudos to Damon, Chris. Mark & Kevin for a well organized and enjoyable evening. It was inspiring to listen to our many beneficiaries and learn about the real difference they are making in so many veterans' lives. It makes me want to get more involved but the hardest part for me is choosing just one to volunteer with now! Special kudos to Damon for his tireless work on the Ride. His job of "herding us cats" is not easy but he does it with quiet determination and fairness, with 1 single goal in mind: raise as much money as possible for our Heroes. Thank you for the support you give to the Ride, the RFTH Committee and to our community! 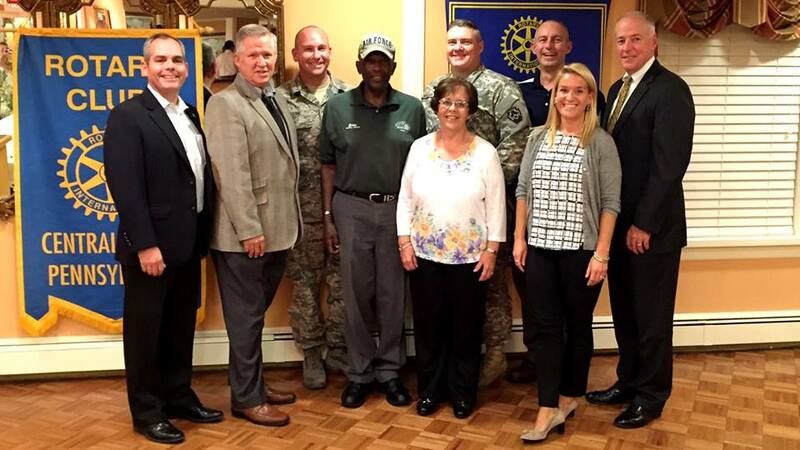 Over the five years in existence, the Central Bucks Rotary has donated over $130,000 to veterans programs in the Central Bucks area. This year's beneficiaries are The Manion Foundation, Operations Homefront, Vets for Vets, B.C. Vet Transportation Program, Gold Star Mothers, Food for Troops, Delaware Valley Stand Down. Visit the Photo Gallery. And Save the Date...The 2015 Ride for the Heroes will be held on Sunday, June 7th, 2015. 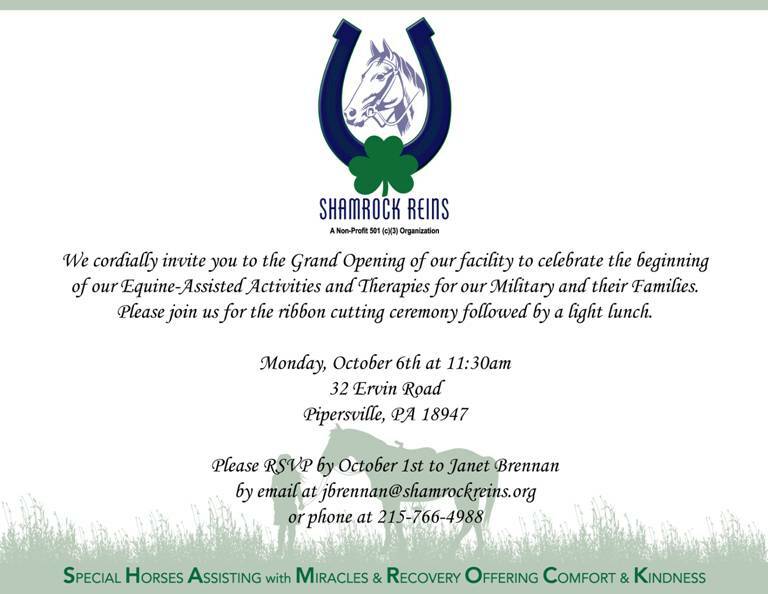 Shamrock Reins is having their official grand opening on October 6th, 2014. Shamrock Reins is a new veterans based charity that is just up the road from us. As a club, we will be doing work with them in the near future. Janet Brennan, the Executive Director has extended this invitation to all Rotarians. Shamrock Reins was covered by the newspaper recently in an article about how they are offering a way for our nation’s veterans to heal. Shamrock Reins is a great facility and you can read the newspaper article and learn more by clicking here. 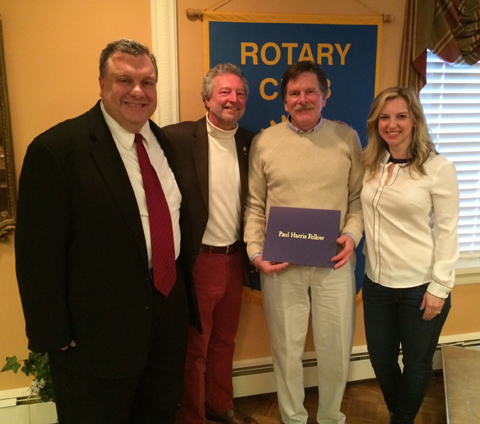 Central Bucks Rotary was honored to have as a guest Gary Fedorcha, our District Governor. He spoke about the 2014/15 Rotary Presidents Theme of "Light Up Rotary" and how he hopes to do so through educating our local communities about our great charitable work and other projects locally and internationally. 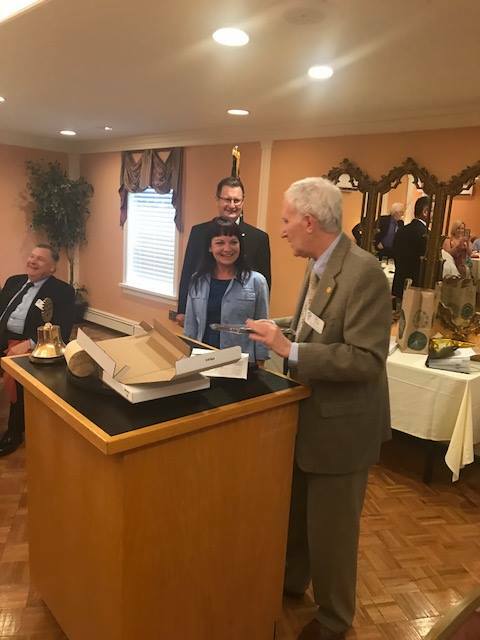 We also recognized and presented to three of our members (Jack Skudris, Mark Glidden, Jennifer Statler), the Paul Harris Fellowship Award for their donations to the Rotary Foundation. 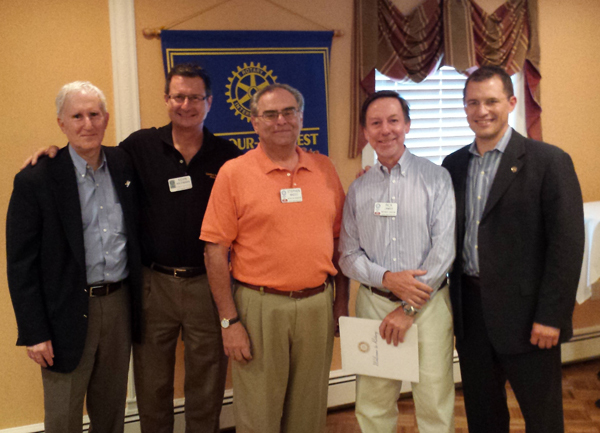 On August 5, 2014, Central Bucks Rotary welcomed two new members, Steve Mazzo and Rick James. Steve gave a great classification talk at a well attended induction ceremony. Steve's Rotary Classification is Retired DOD Contractor, and Rick's Classification is Independent Consultant. 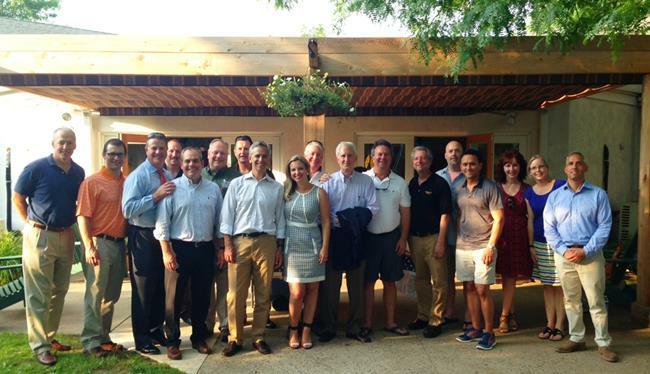 On June 17, 2014, the Central Bucks Rotary Club met at Ridge Crest in Sellersville to celebrate the Grand Opening of the Ridge Crest Pergola/Shade Canopy. 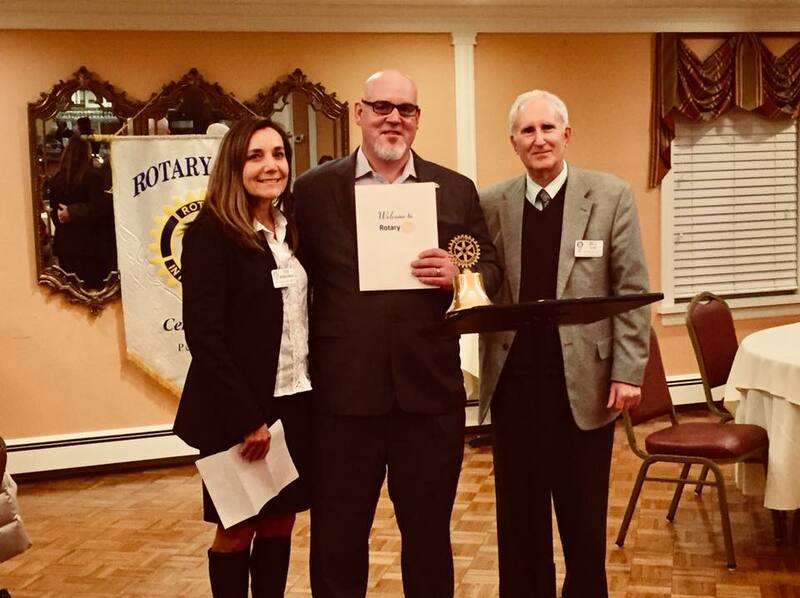 The Central Bucks Rotary Club’s Rotabuild raised funds and completed the $24,000 project that will provide a higher quality of life for 30 children and residents of LifePath's dedicated pediatric facility, Ridge Crest. Ridge Crest is a resource in Sellersville where medically-fragile and technology-dependent children and their families find the help they need through community-based support. See Slide Show. 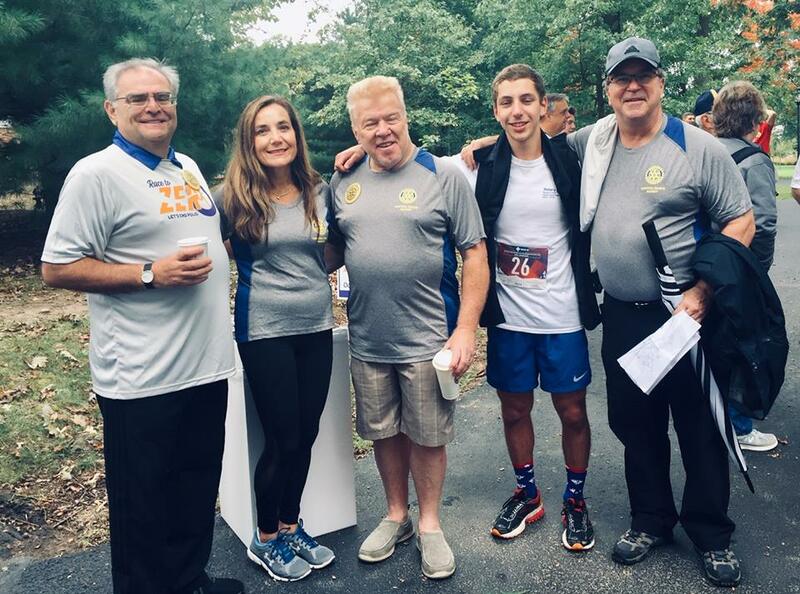 Thanks to all for helping Central Bucks Rotary to support wounded veterans and the families of fallen heroes in this year's Ride For The Heroes held on June 1, 2014. Relive the special memories from the 2014 Ride For The Heroes by clicking here (event code a751549d) for a slide show, or here for a video. 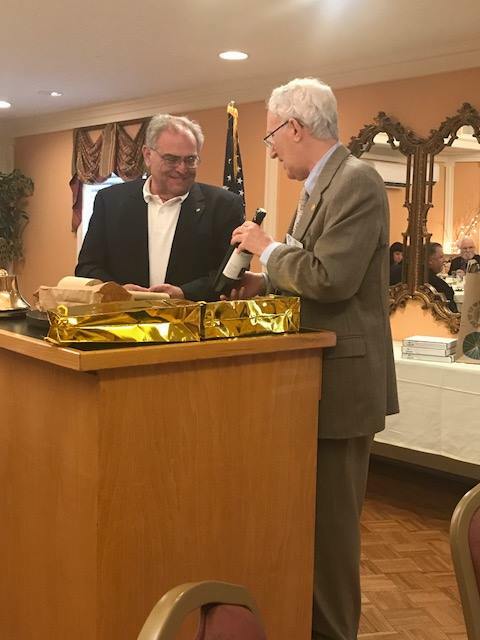 On Tuesday evening, April 29, 2014, Central Bucks Rotary hosted 11 Rotary members from the Turkish Friendship Exchange along with several members from the Doylestown Rotary club. We also inducted and are proud to welcome our newest member, Sally Fehrs whom has already been active on the Service Committee. Please see photos below. 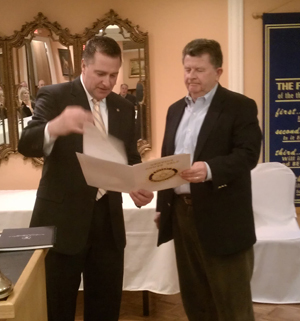 Last night, April 1, 2014, CB Rotary welcomed and honored our newest Paul Harris Fellow, John Gray. We also inducted new Member Tom Maclin, whom also gave and excellent Classification talk. 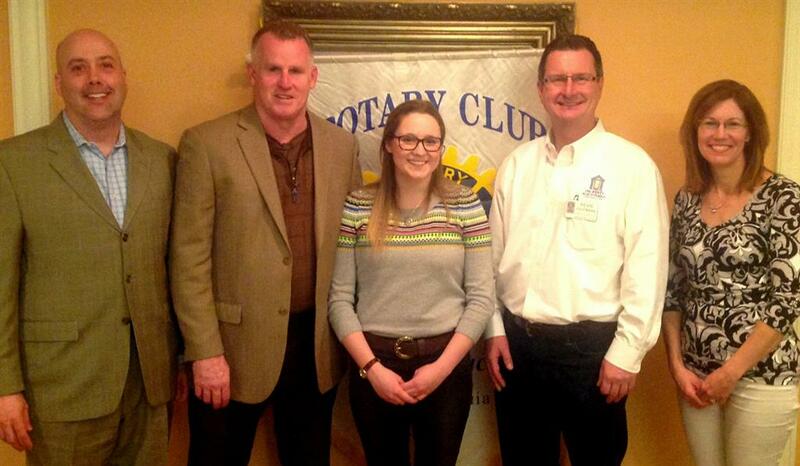 On Tuesday, March 4, Central Bucks Rotary welcomed our outbound exchange student, Katie Marron. Katie will be studying in Bolivia. She is pictured below with her parents. Many thanks to Oz Whitesell for all his efforts with our Exchange Program. Thanks to all Central Bucks Rotary volunteers at the Doylestown Food Pantry yesterday, Sunday, March 23, 2014. It was a great day of service for the community! 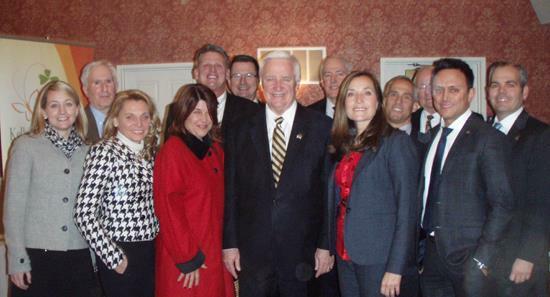 Last Wednesday, January 29, 2014, several members from Central Bucks Rotary participated in a District Rotary event, which was dinner with Governor Tom Corbett. 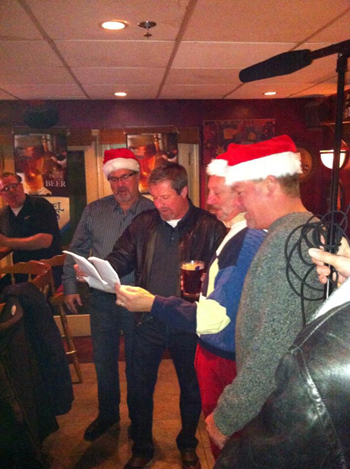 On December 4, 2013, Central Bucks Rotary kicked off the Holiday season with a stroll through Doylestown visiting some of it’s finest local establishments. Appetizers, drink specials, prizes, and raffles were enjoyed by all!! Click HERE to View our Video! 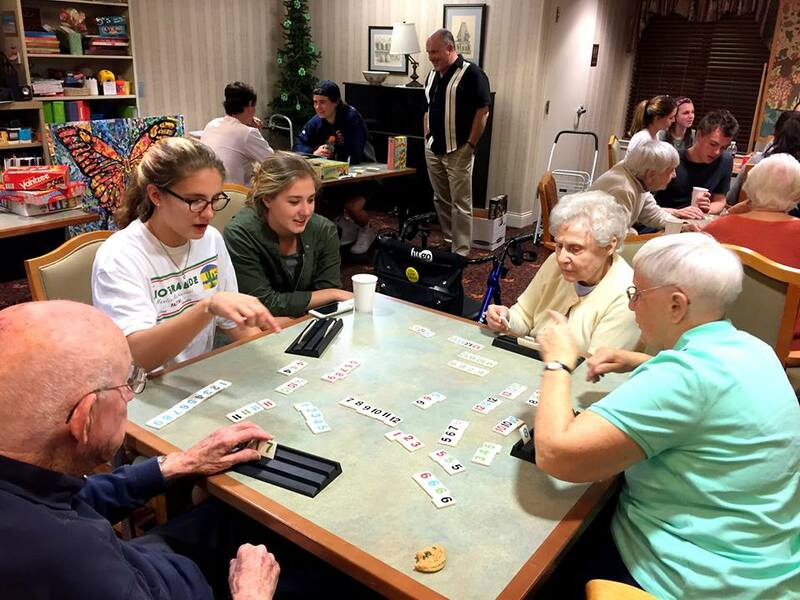 The Central Bucks Rotary Club’s Rotabuild raised funds and completed a $24,000 project that will provide a higher quality of life for 30 children and residents of LifePath's dedicated pediatric facility, Ridge Crest. Ridge Crest is a resource in Sellersville where medically-fragile and technology-dependent children and their families find the help they need through community-based support. See Slide Show. Additional thanks to the following volunteers who helped make this effort happen: Chris Lewis, Bill Rossman, Tim Ernst, Mark Glidden, Jen Walton, Jim Scollon, Mike Raphael, Pam Northrop-Gundlach, Wehrung’s, Taylor Presnell, Kathi Atkinson, Stephan, Chris Kulesh, Trip Northrop, Mike, Scott L., Kathy. 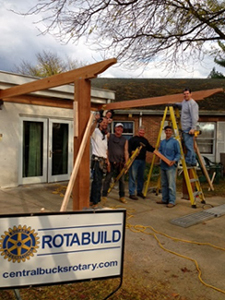 Central Bucks Rotary’s ROTABUILD team nails it again! 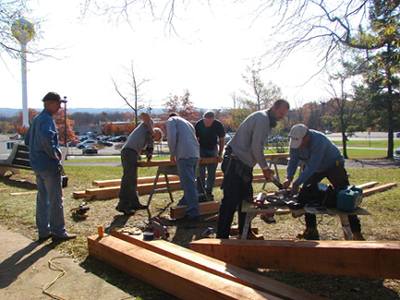 The all-volunteer building crew built a much needed shelving unit for the Doylestown Food Pantry. Materials were donated by Wehrung’s – who have generously contributed supplies and wood for the past four ROTABUILD projects. 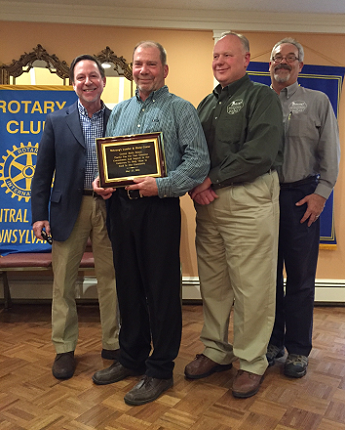 Central Bucks Rotary members are no strangers to the Food Pantry. 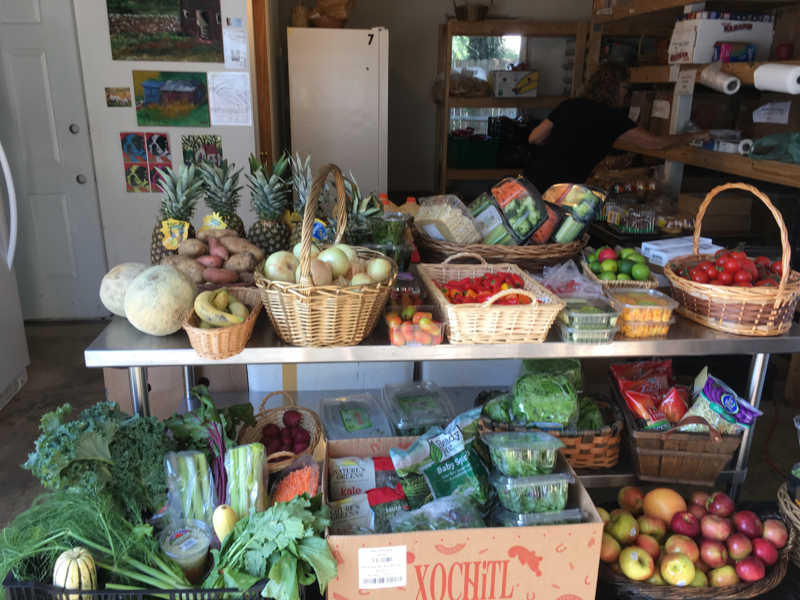 Over the past three years, members have volunteered at the pantry every other month. In addition to this project, previously the ROTABUILD team has installed equipment to help injured and disabled local community members have accessibility in their homes. Our 47th member was inducted at our weekly meeting last night April 2, 2013. 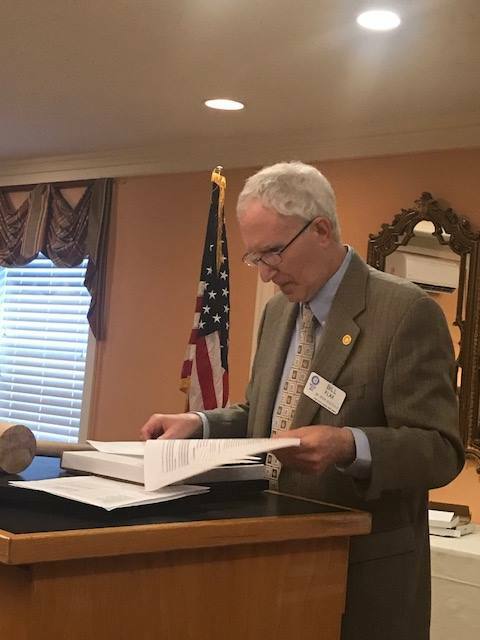 During his classification talk, Joseph Hebert told us about his days in the Navy and Navy Reserve, his Cajun heritage and what brought him to Rotary. 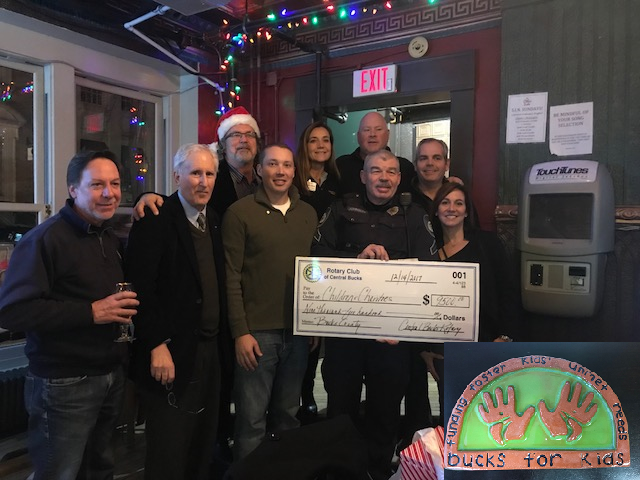 The Rotary Club of Central Bucks held a Holiday Fundraising Event at Bobby Simone’s Trompa and raised $5,000 to donate to the memorial fund of Holly Huynh. Nine year-old Holly Huynh was killed in a car crash over the Thanksgiving holiday. Several Rotarians have families in the area, and some of their children attended school with Holly. A Special Thanks to our Non-Rotarian Volunteers! President Espo recognizes the gang from Wehrungs, along with Tom Kantner Jr, Julie Kantner and Bill Rossman lll for their volunteer service effort at the latest ROTOBUILD project. THANKS again!!! In the twilight of her life, 71-year-old Betty Nemeth had a simple wish — that someone would build a ramp to her front door so she could leave the house without a struggle and occasional injuries. That wish recently came true after the Twilight Wish Foundation put out a request for donations to help her. Notification has been received from Rotary International that two of the shelter boxes we purchased, numbers 19774 and 19775, were deployed to help survivors in South Sudan. Good to know our shelter boxes are helping those in need! Click HERE to Donate or Pay your Dues.